See Part-1: How many Jews does it take to confuse me? I was simply delighted that my new friend Jeff Blankfort had even bothered to write back, as most brilliant chiefs, both Eastern and Western, gallantly rising to defend the Palestinians as their own cause célèbre, simply tend to ignore the meddlesome and the confused who don't buy their craftsmanship. The crazy thing is, that among the Palestinians themselves, many appear to prefer running from Jew to Jew to solve their problems, as was observed by a Palestinian friend of mine out of sheer frustration: “We run from Jew to Jew, they create the problem, and also argue the solution, they control the full spectrum of our discourse as well as our existence.” I promised Jeff: “Thank you mon ami for your reply. I will compose a thoughtful reply later...”. This Part-3 attempts to respond to Jeff Blankfort's request for evidence for the trumpeting-defecating elephant in the bedroom. As quoted above, Jeff asked for “direct evidence with unimpeachable sources”. I will humbly endeavor to provide both – direct, unimpeachable. And before concluding, I will even suggest that the legal standard itself for proving criminal conspiracy is far less than what Mr. Blankfort has generously demanded from me, for the obvious reasons that even half-smart conspirators usually hide behind their errand boys, like the Mafioso, and don't leave their calling cards. More empirically however, unlike the dumb Mafioso who rob, extort, and kill illegally thus enabling the state policing apparatuses to be used to juridically hang them, brilliant conspirators usually enact legalisms and statutes, and directly employ the state's governing apparatus itself to mask and legalize their dastardly plunders, their war-mongerings, their social-engineerings, and their pernicious subversions of the peoples' democratic institutions and constitution. Even the flag-waiving ordinary indoctrinated American understood how that craftsmanship worked when he and she witnessed the banksters' bailout extortion racket in October 2008 (see 'Why bluff Martial Law') and their subsequent brazen accounting of how they spent it (watch). And yet, the law of un-intended consequences, i.e., nature, still has its ways to un-obscure the golem if one has the eyes and the will to perceive. Let me first state the criterion for proof as Blankfort did not stipulate any beyond “direct, unimpeachable”. I intend to demonstrate that an omnipotent power exists, that such a power visibly existed not too long ago using unimpeachable sources, and since there is no evidence of such a power suddenly eviscerating, that by the sheer force of logic, it must still exist even if occulted from mainstream Americans today. And I will top that off with the confirmation of its own existence by the omnipotent power itself. I invite the readers to pretend that they are a jury member, and reach their own verdict whether the following can be sufficiently deemed “direct evidence” from “unimpeachable sources” to satisfy the request of Jeffrey Blankfort and all those like him who choose to willfully remain innocent of knowledge of the most glaring, trumpeting, shitting, elephant in the bridal suite. First, the unimpeachable source: Nuremberg Military Tribunal and its official Record. I don't think there can be anything more unimpeachable a source than that, do you? Let's first see what transpired at Nuremberg in the score-settling with victor's justice in the aftermath of Word War II with respect to the Nazi banker most instrumental in financing the Nazi war machine, Hjalmar Schacht. While 21 Nazi chiefs were hanged (watch) by Robert H. Jackson, the chief prosecuting counsel for the United States (watch), the banker whom the chief counsel as the official representative of the United States government to the Nuremberg Military Tribunals, most wanted to hang, was set free due to the intervention from the Bank of England governor Sir Montagu Norman! Say what? Bank of England is so powerful that it prevailed upon their own military Allies at Nuremberg to let go of the principal enemy who financed the destruction of entire Europe and of the British Empire itself – with agreement from all the Allied military high command and their governments (with only Russia dissenting)? No, you did not read that in history books did you, nor did you hear Noam Chomsky talk about the inconvenient case of Hjalmar Schacht even when he waxes eloquence about victor's justice at Nuremberg by highlighting the case of Admiral Karl Dönitz, and evidently, nor did you hear Mr. Jeffrey Blankfort bring it up in all his dissent-ing critique of Noam Chomsky. ‘The smart way to keep people passive and obedient is to strictly limit the spectrum of acceptable opinion, but allow very lively debate within that spectrum – even encourage the more critical and dissident views. That gives people the sense that there’s free thinking going on, while all the time the presuppositions of the system are being reinforced by the limits put on the range of the debate.’ --- Noam Chomsky. I have to wonder about my sanity sometimes – why don't I get it when brilliant chiefs inexplicably dabble in their own thought control, in their own self-policing? Why do I persist in experimenting with independent thinking? Just accept the pious statements of the Jewish chiefs that there is not a shred of evidence of the existence of the King of the Jews controlling the state of affairs in the world today, lest I be labeled a 'kook', a 'denier of established truths', and carted away to some re-education camp for my own, as well as other's safety! 'Denier' I have already been anointed by none other than a recovering Jew, a reformed Zionist, Christian friend of mine, Israel Shamir! Yes, I know I have accumulated some lovely friends in my few journeys into the unknown world of independent thinking! I now try my best to stay away from such confusions, and I believe this is one of my last few times as my new year's resolution! 'Yes, confessionals after faits accomplis, is a characteristically “cleansing” Christian tradition. Somehow, it only seems to work for those in absolute power, never for the common man. “You're right, we did it. We're very sorry. But thanks to you, we won't do it again” [Ben Bernanke to Milton Friedman] doesn't seem to be part of the ordinary judicial system where the common man is made accountable for stealing bread. But it is part of the Nuremberg Military Tribunals which let Dr. Hjalmar Schacht, the former governor of the Reich Bank  – the bankster who orchestrated the financing for Hitler and enabled his war machine with funding from Wall Street  and the City of London financiers – go scot-free! Footnote  Dr. Hjalmar Schacht (Reich minister of economics until 1937, Reichsbank president until 1939). David Irving, Nuremberg, The Last Battle, 1996, page 160. Is it too rude to ask – that if Montagu Norman is merely among the “technicians and agents of the dominant investment bankers of their own countries”, then who is the dominant investment banker of England who has in fact controlled the Bank of England and the City at least since Waterloo? Rothschild N. M. and Sons. But here we shall just stick with Nuremberg for the moment. Sir Montagu Norman, at the behest of the owners of the Bank of England, set one of their own criminal banksters free from the clutches of the hangman's noose. Those owners, both commonsense and force of logic suggests, commanded at least that much power which could trivially prevail upon all of the Military Tribunal members, except Russia who voted against it. Americans had lost 300,000 soldiers in that 'just war' against the axis powers, the United Kingdom had lots its empire along with its jewel in the crown, and Europe lay decimated, 6 million Jews exterminated – we won't quibble with the holocaust industry here – 20 million Russians butchered, and sum-total of 50 million human beings, mostly Christians, and most of them German civilians under the unspeakable fire-bombings of civilian cities by the Allies, lost their lives in the name of fighting the aggression initiated by the Nazis which was even termed “... the supreme international crime differing only from other war crimes in that it contains within itself the accumulated evil of the whole”. Just watch the video of the closing speech of Robert Jackson condemning the Nazis (cited earlier). It was a superlative public relations Tribunals, because, it was utmost important for the United States of America, the emerging superpower from the ashes of World War II, to pontificate to the entire world its moral and military supremacy, and condemn the abhorrence of aggression of the Nazis as it was itself entering a new Cold War with the new enemy. Nuremberg was entirely about public relations. And the United States judges at Nuremberg wanted to make an outstanding example of the Nazi war machine and its bankster to demonstrate their own moral high grounds. Despite all of these empirical motivations, those who controlled the Bank of England, call it Foundation-X for the lack of a better handle to refer to this non-existent power which none can see, could spring one of their own from the sure jaws of death? This incontrovertible fact and its significance indicates the existence of a power which is superior to the combined power of the victorious allies of World War II. So, the evidence of Hjalmar Schacht being set-free unequivocally demonstrates at least the existence of an elusive omnipotent power in 1946. And we already know that this immense power also existed in 1917, when the Balfour Declaration was issued in its name (see Part-2). Caption Revisiting the Curse of Canaan: The Balfour Declaration November 2nd 1917 - The first-cause of Palestinian genocide in the Land of Canaan is in the Name of a Rothschild and yet they don't know that name! Where did that amazing power, which was confirmed to exist in 1917 when it prevailed upon the British empire to grant the Zionists another's land, and again in 1946 when it prevailed upon the British and American empires to grant amnesty to their own arch enemy that had seen tens of millions of Christians dead, so suddenly vanish in the mere 60 years since? Did the earth swallow it, did the sky absorb it, or was there an earthquake which sunk it? In my experiments in confusion, I valiantly searched for such a catastrophic event which could have silently vanquished that Foundation-X which had existed only 60 years earlier. In the meantime, back here on earth outside the Plato's cave, by the sheer force of inevitable logic, I must rationally conclude that such a power, Foundation-X, still exists right here on earth. And, since I have also not found, despite vigorous search in libraries and on the web, any evidence that the Foundation-X ownership surreptitiously changed hands except from generation to generation within the same DNA cess-pool, and as admitted by the scions now wielding the baton themselves, then, whomsoever were the owners of Foundation-X in 1946, and in 1917, are still the owners today. 1) The conspiracy can be proved by circumstantial evidence. 2) Any conspirator is guilty of any substantive crime committed by any other conspirator in furtherance of the enterprise. 3) A statement of a conspirator in furtherance of the conspiracy is admissible against all conspirators, even if the statement includes damaging references to another conspirator, and often even if it violates the rules against hearsay evidence. “When the King asked him what he meant by infesting the sea, the pirate defiantly replied: 'the same as you do when you infest the whole world; but because I do it with a little ship I am called a robber, and because you do it with a great fleet, you are an emperor. '” (The City of God against the Pagans, Page 148). 3. It must be noted that men with bad instincts are more in number than the good, and therefore the best results in governing them are attained by violence and terrorisation, and not by academic discussions. Every man aims at power, everyone would like to become a dictator if only he could, and rare indeed are the men who would not be willing to sacrifice the welfare of all for the sake of securing their own welfare. 4. What has restrained the beasts of prey who are called men? What has served for their guidance hitherto? 5. In the beginnings of the structure of society, they were subjected to brutal and blind force; after words – to Law, which is the same force, only disguised. I draw the conclusion that by the law of nature right lies in force. Based on insights gleaned from these contortions, especially item 5), if you can enact Federal Statutes and laws to protect your graft by wielding the hidden might of your indomitable force, then, there is no “conspiracy” in the legal terms because you did not violate any Federal Statutes! So, the House of Rothschilds, using their hired front men and political errand boys, backed by their interlocking interests in all the world's central banks, have protected themselves from that definition of Conspiracy by shrewdly employing the uber-Machiavellian Protocols! But have they protected themselves from RICO? See my editorial which contains an extended excerpt of laws from the late Eustace Mullins' 1985 book World Order, which could have potentially been used in earlier times. I now believe that the accelerated pace towards world government today, under the complete co-option of all organs of state worldwide, makes the bankster fraternity almost immune by way of any legal recourse in the entire Western Hemisphere. They might occasionally sacrifice a red herring errand boy here and there at the altar of reform to keep the plebeians happy, if it ever came to that! These are the ultimate UNTOUCHABLES! No one can even see them. All persons of any faith (or no faith) not entirely consumed by depravity, apathy, Faustian pacts, and if I might be so bold as to emphatically add, pious hypocrisy, should have no qualms calling a spade a spade. What prevents one from doing so, is suggested in my pamphlet: How To Return to Palestine This Day Forward. What can one do about it today? Practicably nothing, as suggested in: “Of Ostriches and Rebels on The Hard Road to World Order”. But I pray that I am mistaken, that Machiavellian political science and infinitely deep pockets of the oligarchy exuded through their tax exempt foundations, private central banks, income tax levied upon masses, and national debt levied upon nations – an inflexion of power which can bring combined superpowers to their knees – can straightforwardly be trumped by copious narratives of dissent chiefs and plebeians' abundant prayers! Thank you, ladies and gentlemen of the jury. I am not sure that you would necessarily care to know my opinion – but I thought I'd forward you the following letter nevertheless. It is a short communication to an MIT co-alum who had asked me for my opinion of your recent interview ( Jeffrey Blankfort: Chomsky misfires on US-Israel relations — By Kathleen Wells on November 4, 2010 ). I finally got some time to read the interview – and read almost half-way through until I got bored. Mr. Blankfort is both perceptive and accurate, as far as he goes. I learnt some interesting factoids in it, like He is Jewish, that he had joined AIPAC, etc. I admire Mr. Blankfort all the more for his standing up to what is right and moral irrespective of his own tribal affiliation, and his not giving in to expediencies and abhorrent political realities on the ground. The latter argument is Noam Chomsky's forte, and my good professor has made them time and again, all of which I have deconstructed in considerable depth in my 2007 essay “The endless trail of red herrings”. James Petras' list includes only a subset of the hundreds of Jewish organizations throughout the world, and almost all the national and international level think-tanks along the Hudson and the Potomac, not to forget Hollywood/newsmedia moguls, nor the average Jewish person who is suckled on the mother's milk of Zionism since birth which creates that tribalism that Mr. Blankfort mentions. How comes Europe succumbs to the same pressures as the United States? What is the common prime-mover? Blankfort is silent. I am not. The difficulty is that Mr. Blankfort's silence is more meaningful and instrumental than my loquaciousness because I am an unknown, whereas Blankfort is nationally and perhaps internationally known. 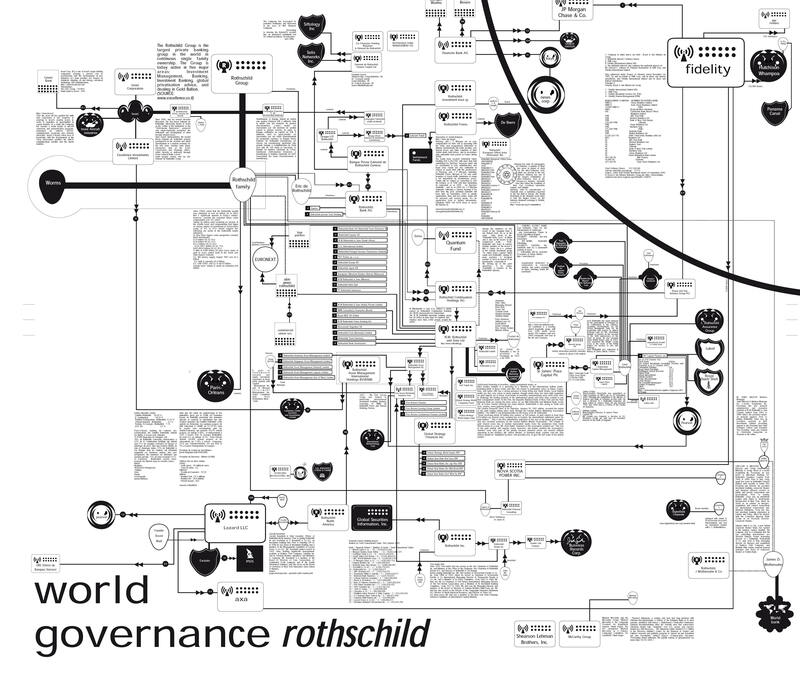 I do not mention the Rothschilds because I have yet to see a single shred of evidence that they control the world's money supply, the CFR, or anything else of such substance as to influence the way the world works. As far as I can tell whereas once members of the Rothschild banking family ran the banks of Western Europe, I see no evidence that they do so today. There are a number of other Jewish bankers who have surpassed them in influence and if the Rothschilds were as powerful today as you claim them to be, there would be some kind of trail to find at least a hint of what they have been doing. In my interview I spoke only about the Zionist operations in the US because they are far and away the most important but I am more than aware of their activties in the UK with all the major parties as well as in France, Italy and Germany. It is their money combined with their organization, plus the fact that there is no serious political opposition that enables what I call the Ziontern (Zionist International) to have its way. As in the US, most Palestinian and pro-Palestinian groups are hesitant to take on the Ziontern internationaly or in their own backyard because they are either dominated by or intimidated by what Gilad Atzmon first identified as "Jewish tribalists," who while they may be genuinely anti-zionist are as ready and willing to shield Jews from collective blame for their crimes against the Palestinians and Lebanese as any Zionist. These are the folks who routinely attack me on their blogs when I expose their hero, Chomsky. Again, if you have any direct evidence with unimpeachable sources that the Rothschilds are running everything or for that matter anything behind the scenes I would appreciate receiving it but lacking that up to now, I never mention their name apart from Walter Rothschild being the recipient of the Balfour Declaration. It was Judge Louis Brandeis, however, an American Jew, who apparently was the one who convinced Woodrow Wilson to break his vow to the American people to go to war. And it was Edward Bernays, Freud's nephew and the father of modern propaganda who devised the campaign to get Americans willing to support the war. Finally, I support BDS, not because that is the ideal tool for international organizing against the Zionists but that given the relative little strength we have as a group, it is the only means at the moment that has a chance of getting anywhere. Here, in the US, I would like to see campaigns exposing every member of Congress who has sworn their loyalty to Israel, be they Jewish or not, but I don't see that happening. Even at Al-Awda conferences, there is a tendency to stay away from discussing such political activity.